SK Hynix has updated their product catalog with HMB2 memory, with each module sporting 4GB of memory and 204.8GB/s of bandwidth. These modules are not the fastest sets of HBM2, with the company previously listing HBM2 modules that feature memory with speeds of 256GB/s (2.0Gbps) rather than the 204.8GB/s (1.6Gbps) model listed below. SK Hynix lists their HBM2 modules as becoming available in Q1 2017, making it seem like an ideal candidate for use with AMD's upcoming Vega 10 GPUs. It is expected that SK Hynix are still working to release 4GB and 8GB 256GB/s HBM2 memory modules in 2017, though it will likely not be ready for AMD's Vega 10 GPUs. When AMD's pre-production Vega 10 GPU was shown off at CES, the GPU was shown as having two HBM2 memory dies, with photos of the test system showing the GPU as having 8GB of VRAM, suggesting that the GPU uses two 4GB HBM2 modules. 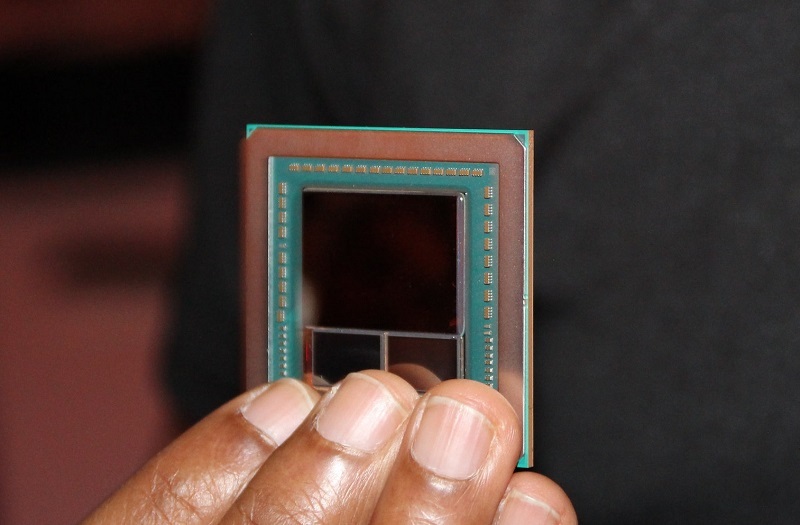 If AMD's Vega 10 GPU uses two of these new 4GB SK Hynix 204.8GB/s modules, offering a combined memory capacity of 8GB and a combined memory bandwidth of 409.6GB/s. This level of GPU memory bandwidth is lower than both AMD's R9 Fury X, which has 512GB/s of memory bandwidth and the Nvidia Titan X which uses 12GB of GDDR5X memory with a total bandwidth of 480GB/s. These memory bandwidth numbers do not tell the whole story when to comes to memory performance, as newer GPU architectures often offer architectural upgrades like delta colour compression which allow certain workloads to require much less memory bandwidth. This means that Vega 10 would likely have a higher effective memory bandwidth than the R9 Fury X, even if it used lower speed HBM2 memory. At this time it is unknown who AMD are using to source their HBM2 memory, with the company potentially using Samsung or Micron or their future HBM2 powered GPUs. You can join the discussion on SK Hynix's HBM2 memory on the OC3D Forums. They did use SK Hynix for the Fury X, but AMD is going to go with the company who delivers the best product at a good price.